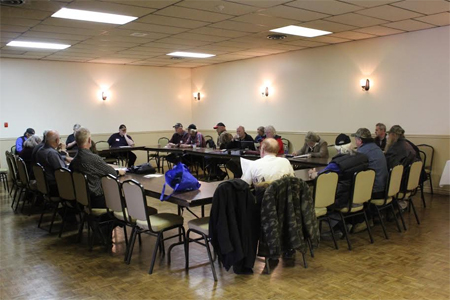 Directors were encouraged to take advantage of the OLA’S website and Facebook page to advertise meetings in their areas. The date chosen for the next AGM is October 22nd in Tyrone. The morning session was followed by a public meeting with speakers Don Johnson on Species at Risk, Liz Marshall on property rights, Tom Black on the OLA’s intention to seek intervenor status in the Gilmor appeal, Dave Hemmingway provided an update on wind turbine construction liens and property assessments, and Jeff Bogaerts who spoke about conservation authorities and investigative negligence. More than 70 people attended the public meeting and most stayed for the excellent roast beef dinner which followed. Special thanks to Don Johnson and the Hamilton Halton Landowners Association for hosting the meeting.